Left without a portal gun, and nothing but an ordinary Morty (or “The Legendary Morty” depending on your point of view), Pocket Mortys starts out with an interesting premise. In order to regain Rick’s portal gun and get back to their home, Rick and Morty must defeat the Council of Ricks in a series of increasingly difficult brute force battles between interdimensional Mortys. In addition to the main objective, there is always the addictive addition of trying to catch all the Mortys running wild throughout the dimensions. The core concept of Pocket Mortys is to be a free-to-play, mobile, Pokémon-clone with a Rick and Morty theme. Pocket Mortys does a good job of duplicating the Pokémon gameplay and battle styles, but many of the features are limited. The most glaring example of this is the combat system. Each Morty has its own range of moves tailored to that specific Morty, but the animations only differ based on the type of move (attack, defense boost, weaken opponent). Veiny Morty’s harden looks identical to Peace Morty’s relax, and while the names themselves are funny, it would have been nice to see some variation in the aesthetic. The sounds Rick and Morty make during battles are also very limited, with the same four catch-phrases being repeated over and over again throughout the game. Battling is mixed up slightly with the Morty “types” of Rock, Paper, and Scissors. These interact in obvious ways (Rock doing bonus damage to Scissors, Paper doing bonus damage to Rock, etc. ), and make it so that crafting the party of balanced Mortys is somewhat strategic. However, with five slots, and only three types of Morty, it can make teams feel bland. None of the Mortys (including the legendary Morty) feel more powerful than others, making it really a cosmetic choice of which Morty to choose. These few differences also make battles very predictable after the first or second portal, and while it can be fun trying to guess the type of an unidentified Morty in a battle, it quickly gets stale. The best aspect of this game is its attention to source material. Pocket Mortys doesn’t really develop a new Rick and Morty storyline, but it does bring back plenty of characters from the show, and the art style is enjoyable. 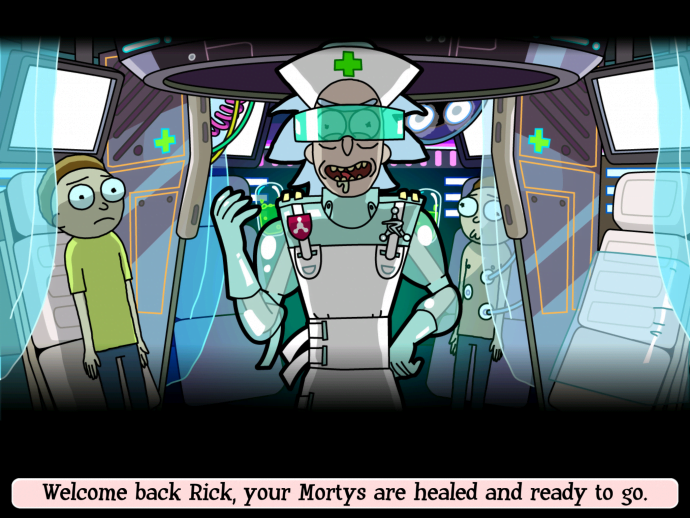 Walking up to a medical center only to be greeted by an eerie, smiling, Nurse Rick saying “Don’t move or blink,” as he takes your Morty’s, makes the game feel worthwhile. Walking around beating up other Ricks and Mortys to an 8-bit version of Goodbye Moon Men, and playing Blips and Chitz machines for new Mortys just felt right. As far as level design goes, Pocket Mortys is not that varied, but it is a free-to-play mobile game, and so some of that is to be expected. The objective in each portal is to find the dimension’s Rick and defeat him in Morty combat. There are side objectives of fighting other trainers and finding loot, but on some levels it can just be easier to go and defeat the Rick without even bothering with anything else. Once Rick collects enough badges he can take on a new member of the Council of Ricks (if this is getting confusing, I apologize). None of the worlds feel particularly different from each other, aside from shader changes, and some minor cosmetic details. The same trainers pop up in every world, and after a while it all gets too repetitive. Finally, Pocket Mortys implements a very fun crafting system. It’s very simple in that the player can combine two objects or three objects, found in the world or through purchase at Salesman Rick’s (the game’s store), and creating more powerful items. Having to discover all of the combinations makes exploring the portals for items feel meaningful, and adds a needed layer of complexity. 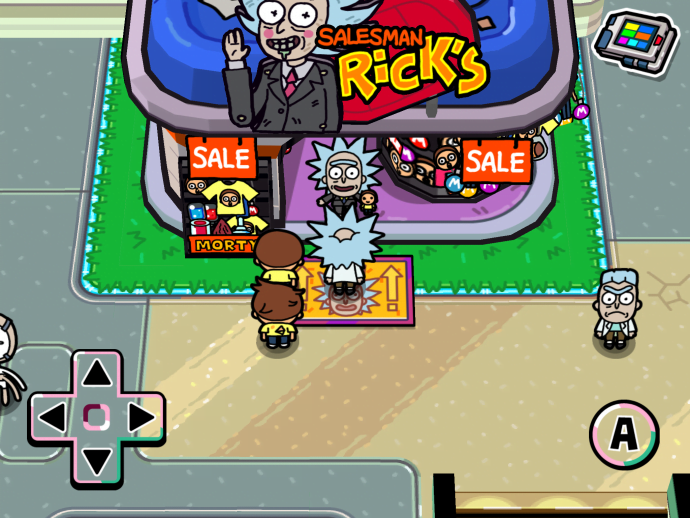 In the end, Pocket Mortys is good for what it is: a free, mobile game for fans of the series. Areas such as repetitive sound effects and animations could have been remedied, but it’s easy to forgive for the price tag. The objectives were easy to complete without paying money, and there are options to make the game easier for those who do want to pay (a miracle in the current gaming landscape). For these reasons, I would recommend picking up Pocket Mortys for fans of the series, and gamers looking to sink a few hours into a funny, free Pokémon-esque title. It doesn’t really create anything new or innovative, but Pocket Mortys still manages to elicit some laughs, and it’s a great way to burn a few hours. 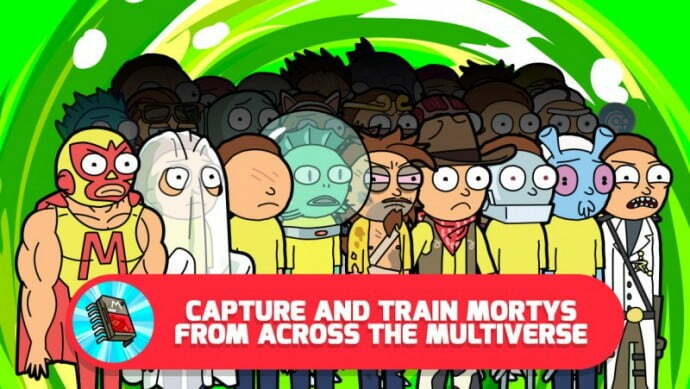 Pocket Mortys is a fun time-waster, and absolutely worth the free price tag on the App Store. Fans of the series will not be disappointed, as long as they keep in mind that the game's scope is limited due to it's free-to-play, mobile nature.